It's always nice to have something in the diary to look forward to after Christmas as once all the hussle and bussle of the festive season has passed, January can seem rather dreary in comparison. At the start of December I'd received a rather intriguing invitation to pay a visit to Ballintaggart Farm and sample their foodie offerings to include either a Cookery Masterclass or Feast Night, plus an overnight stay. A quick look at the Ballintaggart website and their January Seasonal Suppers class caught my eye. Kick start your 2017 with a boost to your recipe repertoire. Leave with a new understanding of everyday ingredients, top tips and inspiration to feed your family and friends wholesome, seasonal dishes with flair. It sounded to me like the perfect start to a new year, my friend K agreed so we popped the date in our diaries for a girlie weekend of food and an escape from children and husbands! Now I must admit that when I first looked at the Ballintaggart website and location it was the word 'Perth' that stuck in my head. It was only the week before our trip when I turned to Google maps that I realised rather than the Fair City it was actually Highland Perthshire. Still no problem until the snow started to fall rather heavily and their Facebook page began to share beautiful, but at the same time slightly concerning, photos of how much snow they had. Nevertheless we set off on our way with an emergency kit in the boot consisting of shovel, grit, screenwash, scraper, de-icer and carpet tiles! As it turned out the roads were absolutely fine with the only real snow being on the final 7 mile stretch after we turned off the A9 just north of the Hermitage. Now I had my bearings with Ballintaggart falling midway between Dunkeld and Aberfeldy. Whilst we made it safely to the bottom of the farm road, passing a rather picturesque Monarch of the Glen style pheasant shoot on the way, there was no chance that my wee Fiat 500 could make it up the sheet ice farm track. It was abandoned and the snow boots were pulled on for the final part of the journey. Our hosts for the weekend were Chris and Rachel Rowley. They moved to Ballintaggart Farm in April 2016 to create a refined rural destination with Kitchen, Garden and Rooms. Previously they had founded Edinburgh's first supper club, Charlie and Evelyn's Table which was a sell out success from 2009-14. This led to a stint at 2 AA Rosette restaurant The Gardener's Cottage in Edinburgh for Chris and the duo decided to leave their corporate past behind and that a full career change was in order. Relocating to London Chris retrained as a chef undertaking the Leiths School of Food and Wine Diploma. From then, he worked freelance as a private chef and gained restaurant experience in London and Cornwall before returning to Scotland. First impressions of Ballintaggart were idyllic. 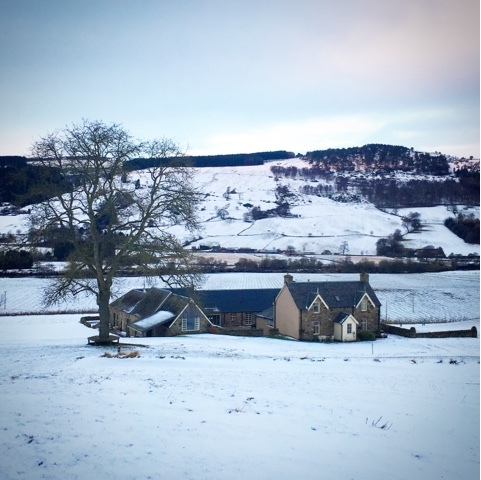 Admittedly the snowy scene probably played a part but the setting itself is stunning with the traditional stone farm buildings nestled in rolling hills with spectacular views over the Tay valley. The welcome was warm both in terms of greeting and a roaring log fire. We were shown to our rooms which were a wonderful combination of minimalist chic style, comfort, attention to detail and luxurious touches. A large guest sitting room with huge windows was the location for morning coffee and cakes (homebaked of course!) and meeting up with the other six course participants. 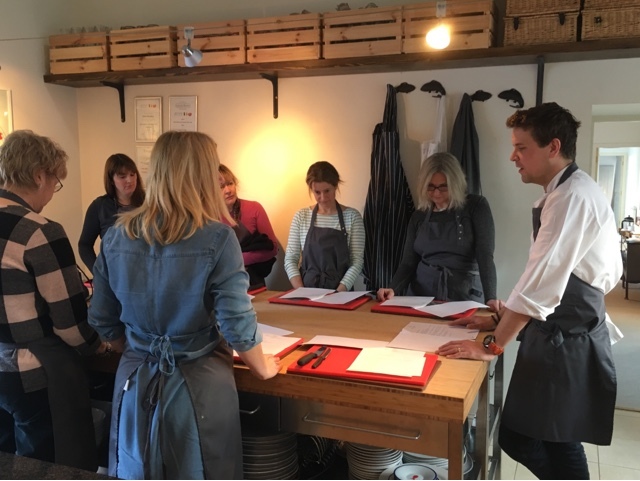 When he managed to get a word in edgeways amongst all the chatter, Chris talked us through the format for the day before we all donned our aprons and headed to the kitchen. The class itself was very relaxed and informal and suited to all abilities. After a quick health and safety briefing (still a bit gutted that I never got to shout 'hot pan') we all got stuck in and worked individually, in pairs and in teams of four to cook our lunchtime feast. 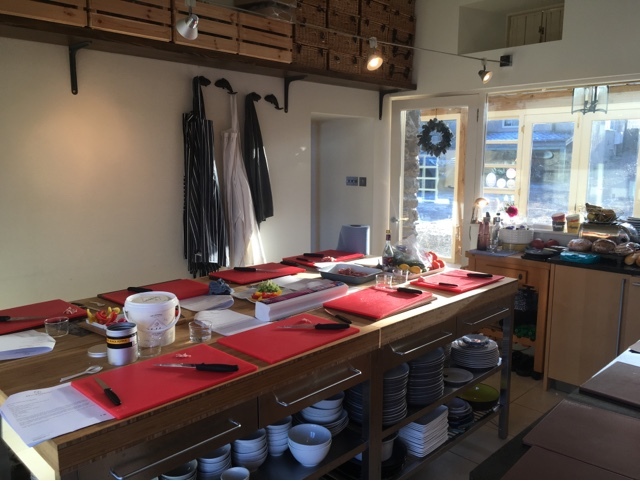 The kitchen worked really well as a teaching space with everything that we needed to hand. The lovely Rowan kept on top of our washing up and along with Chris ensured that we had everything we needed. I could be doing with a Rowan in my kitchen! We all had recipe booklets to work from and were encouraged to ask questions and seek help along the way. Some dishes were demonstrated but most we prepared ourselves. 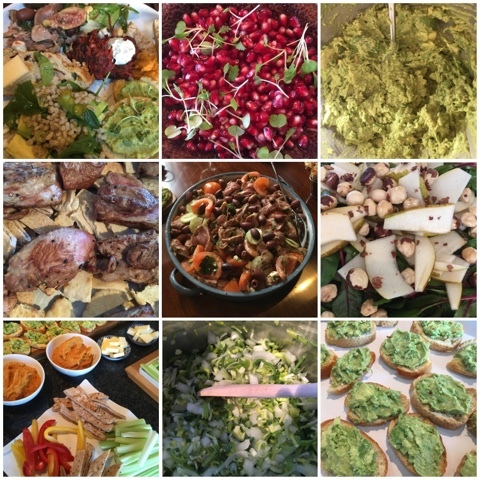 Kale Pesto, Beetroot & Carrot Fritters, Rocket, Hazelnut & Pear Salad, Sesame Farro Salad, Avocado & Tahini Crostini, Butternut Hummus, Lamb Neck, Baked Pita and Fig Salad and for desert; Orange and Pommegranate Cake. The selection of dishes showed that for comfort food in the winter months you don't necessarily have to head down the road of beige and brown stodgy calorie laden carbohydrates. There's plenty of colour to be found in seasonal produce even at this time of year and simple carbs such as potatoes, rice and pasta can be replaced with more complex ones such as pulses and grains. 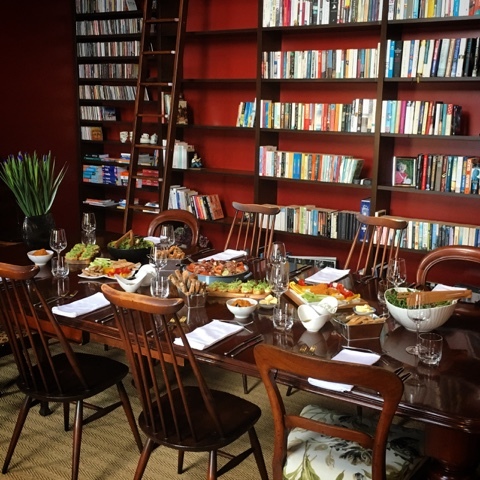 Lunch was served in the stunning Library adjacent to the spacious barn venue space. We all thoroughly enjoyed eating the fruits (and vegetables) of our labour washed down with a couple of glasses of wine (glad we were staying over!). 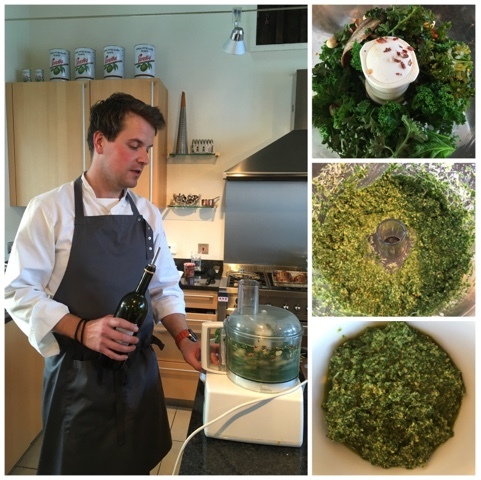 Back to the kitchen with full bellies to prepare the final dish of the day Kale and Taleggio Barley Risotto. All too soon it was time to say goodbye to the rest of the class as they headed home. Time for some fresh air and a quick explore around the grounds. Alas the weather wasn't conducive to either a knock about on the tennis court or an explore on the trail bikes which was a particular shame seeing that my friend K's husband is a tennis coach! We wandered up through what is the summer meadow to the orchard and visited the chickens before a slippy stroll down the hill, past sledging children, and a wander into Balnaguard Village. 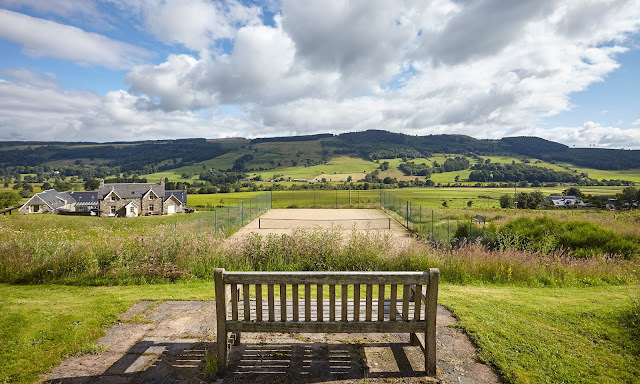 For those who wish to venture further afield there is a set of 6 postcards available which each cover half day or day trips in the surrounding area providing ideas of where to eat, shop, stroll, hike, picnic, explore and generally sup up the scenery along the way. Such a great idea and also supporting lots of other local businesses. 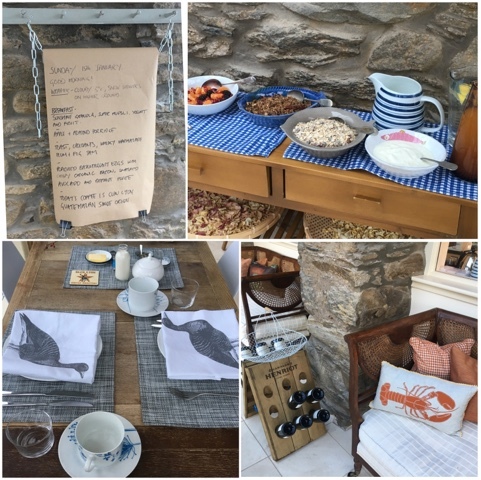 As if we hadn't already eaten enough, tea and cake was awaiting us on our return and we tucked into a slice of delicious honey, lemon, rose and rosemary cake with a pot of tea whilst candles burned, the fire crackled and flickered and the light outside dimmed. Much excitement when snowflakes once again started to fall and we thought that perhaps we might get stranded and have to stay another night - that would have been a real hardship... Chris appeared with a menu for what Rachel had described as a Simple Seasonal Supper. I was thinking this would be the risotto that we'd prepared earlier in the day. How wrong was I. A Ballintaggart simple supper is much removed from such a meal in my house. I hope my family don't start getting ideas. The focus was again fresh, local and seasonal and the food was simply wonderful and full of big flavours. After coffee, tablet and a wee G&T it was time to retire for the night with the promise of breakfast at the original Charlie and Evelyn's Table in the morning. A wonderful sleep was had in the most comfy beds ever. By this time we knew that breakfast wouldn't disappoint and despite still being stuffed from the previous day we stoically went for pretty much the full monty. 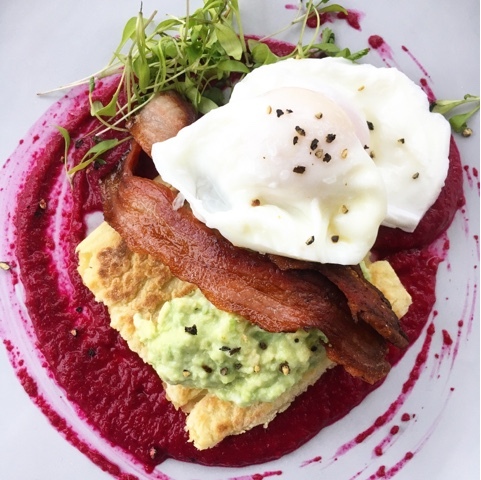 The porridge would have been a step too far but we managed the homemade granola, fruit and yogurt followed by toast and croissants and the stunningly coloured daily special which was Poached Ballintaggart Egg with Crispy Organic Bacon, Smashed Avocado with Beetroot & Gooseberry Puree. Alas the overnight snow had been only a flury and we weren't blocked in so it was time to say goodbye. 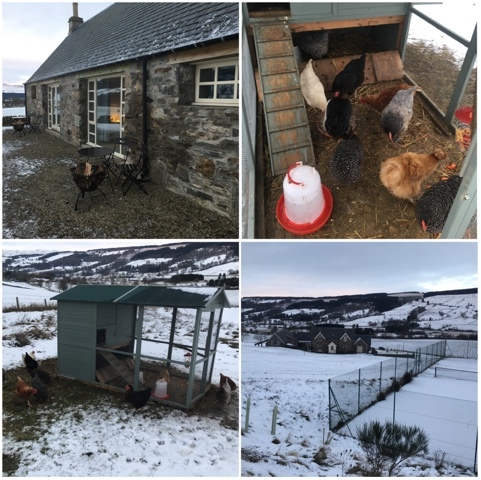 Ballintaggart Farm was the perfect place to get away from it all, eat well and recharge our batteries whist learning some new skills at the same time. The whole set up was utterly charming but not at all twee. A real home from home where we felt like house guests rather than residents. An absolute hidden gem which I can't wait to return to. A Feast Night experience is definitely on the cards. 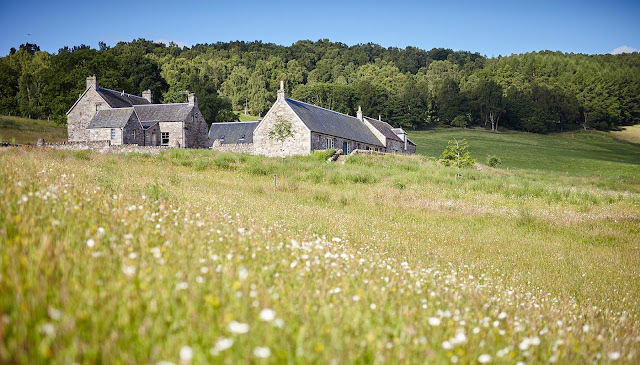 I suspect that Ballintaggart Farm may well become Scotland's answer to River Cottage. New flavours, colours and fresh inspiration for Autumnal suppers and balanced lunches. A chance to bake a selection of delicious loaves from scratch including focaccia and sourdough. The most important of all culinary skills. Learn to chop with skill, speed, accuracy and style. Local speciality roasters take you on a journey from bean to cup and how to make consistently good coffee at home. Secrets to planning and preparing impressive menus without compromising on flavours, presentation or sanity! 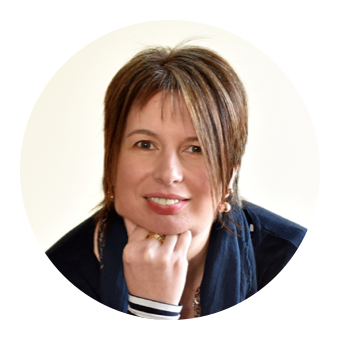 Renowned chocolatier Charlotte joins us to share an introduction to making chocolate, foraged flavours, and edible gifts. 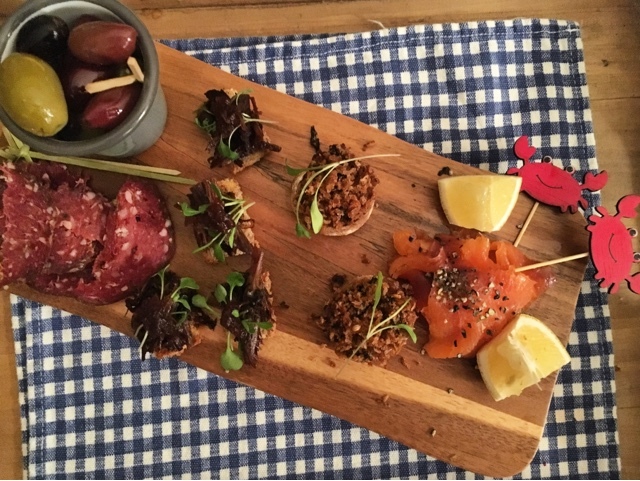 Beautiful, decadent canapés perfectly balanced with nourishing, vibrant Winter recipe ideas. Beginners’ guide to different types and cuts of meat, cooking techniques and secrets to the perfect ragu, roast and steak. Beginners’ guide to Scotland’s world-class ocean larder and how to fillet and cook fish and shellfish. New flavours, colours and fresh inspiration for Spring suppers and balanced lunches. Feast Nights are passionately-executed, seasonal social experiences. 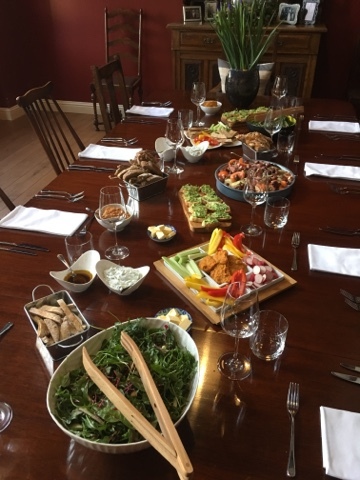 Founded on the concept of communal dining, join us, bring your friends and share some of the very best ingredients the seasons and the area have to offer. We work with incredible local suppliers to create exciting menus with big flavours. Well worth making a detour for! Oh this sounds just my kind of thing, I love learning new skills. You are a brave woman driving your Fiat 500 into the snow, I think I'd prefer to go in the Spring or Autumn! I didn't really know where I was heading - should have done my homework or taken my husbands car. Now that sounds like my kind of outing. What an absolutely gorgeous venue, especially with the snow. Though I wouldn't have been too happy driving in it either. It really is such a special place for a whole variety of reasons. I'll have to go back in the summer. What an absolutely fantastic thing to do! 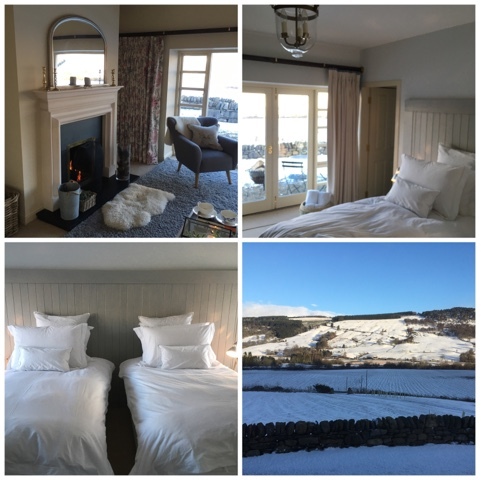 The whole weekend sounds like it was amazing, from the dramatic ditching of the car in the snow, to the gorgeous food prepared and eaten and the luxurious accommodation. I could almost hear the roaring fire as I read! I am really seriously tempted to make my way south this summer for one of their summer masterclasses! Really good price too, for what you get! It was such a lovely thing to do with a girlfriend. The whole experience was perfect from start to finish. What a lovely place to spend a cozy winter weekend in! It looks like you had delicious food as well... I'm totally drooling in front of my laptop! Beautiful location and fabulous food... sounds like the perfect winter break! And wine, there was plenty of wine! well, those food photo's say it all. But how did you fit it all in!? And what, may I ask, is the carpet tile for? ;) hilarious! The carpet tiles are an essential piece of winter kit! If you get stuck in snow/ice you put them under the wheels that are spinning for traction. You can use your floor mats in an emergency but they are more valuable to leave behind!! !